Pennants are a type of chart pattern that usually indicate a continuation of a trend after a pause. 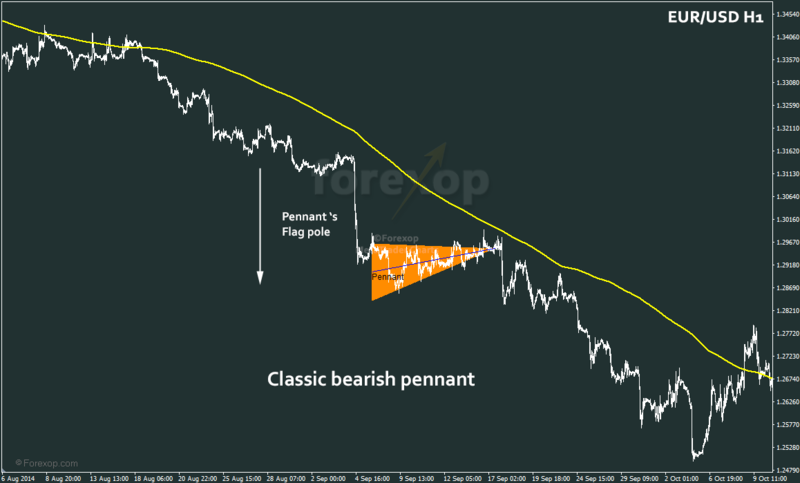 Like triangles, pennants are considered by most traders to be medium to long term patterns. That means chart formations, lasting several days, if not weeks. In currencies you can find pennant-like structures at any time frame down to the minute charts. And the development is often the same as the larger patterns – only on a shorter time horizon. 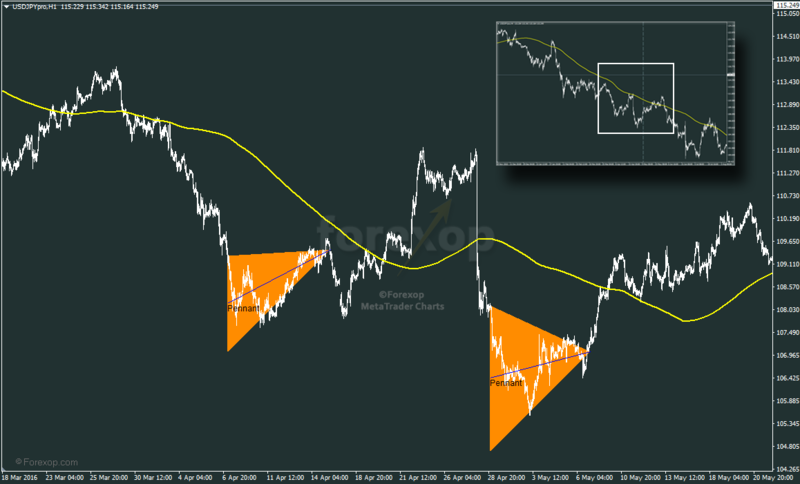 Recognizing pennants and trading them is easier than triangle patterns because they are fairly distinctive. If you’re in doubt you can use our pennant and flag indicator to help find them on the charts you’re trading. Pennants are triangular-like patterns that stand on a “pole”. This is part of the shape is referred to as the “flagpole” or the “mast” and this prominent feature is what gives these patterns their name. Flags are a closely related chart pattern. The main difference between a flag and a pennant is that the flag’s body is rectangular in shape. Market sentiment during a pennant formation can be understood as follows. To be a true pennant, in the first phase the market must make a strong move in one direction. In addition the flagpole should be reasonably straight. This indicates that the sentiment was strongly favoring one side. In the second phase, the market enters a consolidating period. This is a pause and it’s where the price forms into the pennant’s body. The final phase occurs with a breakout. This happens at the tip or just after the tip of the pennant. The breakout will usually be in proportion to the flagpole size. In a text book case, the exit breakout should equal or exceed the scale of the flagpole. This is the profit target. As with all technical patterns, in real trading situations pennants come in a wide variety of forms. You’ll rarely see cases that look exactly like a text book. The best approach is to look for general characteristics, rather than rare but precise formations. One thing that makes pennant structures easy to find is the existence of the flagpole. This tells which way the market will probably go – at least in an ideal case. This fact makes the trading rule for pennants simple. All things equal, the market is likely to continue in the same direction. And so this is the direction to trade. 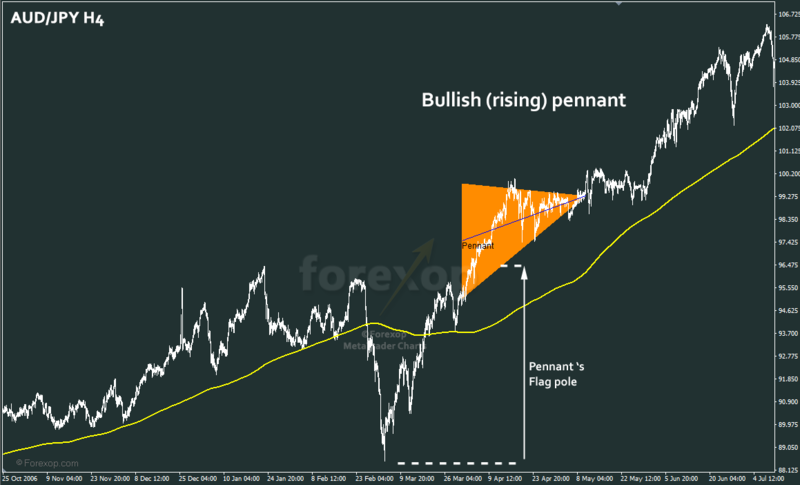 Bullish pennants are usually a reliable indication that a trend is set for a new upward leg. In other words they serve as good continuation signals. Pennants are useful in cases where you’ve missed the first wave of a trend but still want to capture some of the upward strength that’s remaining. You can spot a bullish pennant signal as follows. First wait for an upward price wave. In Figure 2 this is marked between the dotted lines. This upward wave forms the bullish pennant’s flagpole. Next wait for the consolidation phase. In this phase, volatility reduces and the upward trend essentially flattens out into a tip. During this phase the market will fluctuate without any clear direction. In doing so it traces out the triangular pattern of the pennant. The pennant’s body can be angled slightly upwards from the horizontal. But more likely it will point downwards against the trend. If the body is aligned closely to the trend, it’s not a true pennant. It probably won’t produce a strong enough breakout to make the trade worthwhile. Figure 2 shows an example playing out on the chart AUD/JPY H4. Here you can see the “tracer line” that forms the flagpole. During this phase there’s a strong burst of upward momentum. However this quickly exhausts and the market flattens with a sharp drop in volatility. The pennant’s body is nearly horizontal. The flagpole is about 850 pips in height. One thing to note here is that the market was excessively volatile as the “mast” formed. For this reason, we wouldn’t set a stop loss down at -850. That would be below the start of the trend. In this case it’s better to use the moving average line as a guide. The preferred thing to do here would be to set a stop at about 300 to 400 pips below the entry level. The profit target would be a similar size to this. Make sure the stops/profits are consistent with any support and resistance areas. The profit target should be under any upper resistance and ideally the stop should be below a support. In most trends you’ll see the market moving in “fits and starts” rather than a straight descent. These step patterns often appear as bearish pennants. Figure 3 shows EUR/USD H1 chart. This shows a text book example of a bearish pennant. Here you can see a clear and abrupt drop as the flagpole traces out. This is marked with the arrow. The pennant body then forms as the market attempts a weak recovery. When this fails, bearish sentiment reasserts and pushes the market sharply lower. This pennant pattern forms over about 200 hours. That’s just over 8 days. In this example, we would enter the market short (selling) after the pennant pattern is fully complete. Again, we use the flagpole and the pennant depth as a guide to stop loss and take profit areas. In this case the flagpole is about 250 pips in size. It wouldn’t be advisable here to use a stop distance much above 250 pips. Keep in mind that pennants are technical trades. There’s nothing to be gained in chasing the market upwards when trading a bearish breakout. Unless there’s some other reason to stay in the position. Likewise, we would set the profit target around this size too. In summary then we would have a take profit below the entry level of the pennant at between 200 and 300 pips. Once the market moves clearly below the pennant’s body, it’s a good idea to move the stop loss down to your entry point. That’s around the pennant’s point. This ensures you won’t be caught by any strong reversals. Not all pennants are as clear as the above examples. In real situations, they can be ambiguous and even contradictory. So how do we trade these cases, if at all? The chart example in Figure 4 shows a strong falling trend on the USD/JPY H1 chart. To give some context, the small box on the top right shows a view of the entire trend. Pennants such as those in Figure 4 are fairly typical in real forex charts. In the first case, there’s a strong downward move which halts abruptly. The market then makes a weak but volatile recovery. This forms a pennant body. Following on from the first we don’t see a clean continuation downwards after the bearish pennant ends. Rather there’s another stronger upward leg, before the market succumbs to downward selling pressure again. We then see a similar thing repeated in the second pennant. These patterns could also be considered as “flags” depending on exactly how you interpret the price line. 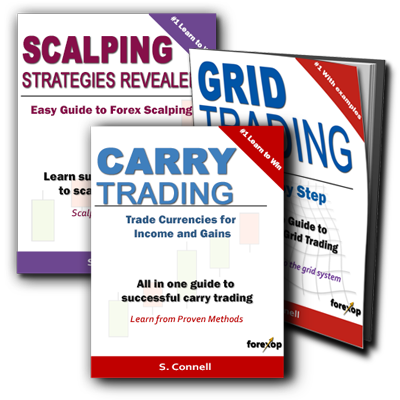 These trades would still have been profitable when using the above rule as a guide for your stop losses. The snag though is there’s more drawdown than when the market makes a clean break in the expected direction. More on the pennant/flag indicator. I agree, wait for a valid signal only in a break out else don’t do anything. Trade on EUR/GBP, AUD/USD usually 1 or 4 hour. I look for the wedge or pennant as well as the broadening wedge, the opposite shape & it can give same signal. Thanks Steve for this post. How do you recommend to trade the pennant and the flag – together or you trade them with two totally separate strategies? It seems like they come as a pair.